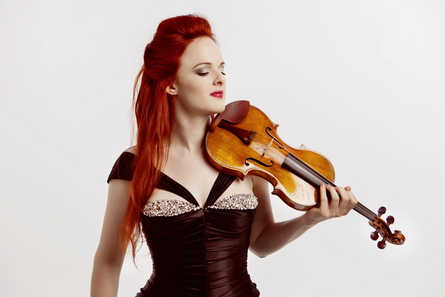 Swiss violinist Rachel Kolly d'Alba is one of those very rare players whose ability to connect with audiences is such that it's easy to overlook her sizzling virtuosity, honeyed vibrato and impeccable taste. A child prodigy who made her debut as a concerto soloist at the age of 12, she has been lauded both for her electrifying intensity on stage and her beautifully nuanced recordings of works by composers including Saint-Saëns, Chausson, Gershwin, Ravel and Ysaÿe. Rachel Kolly d'Alba's impassioned playing has led to solo performances with many of Europe's finest orchestras, including the BBC Philharmonic Orchestra, Orchestre de l'Opéra de Paris, WDR Cologne, Real Orquesta Sinfónica de Sevilla and the Rotterdam Philharmonic. For this tour she will be joined by the award-winning Swiss pianist Christian Chamorel, a much sought-after chamber musician and soloist who has performed at such venues as the Konzerthaus Berlin, the Palau de la Musica in Valencia and London's Wigmore Hall. Gabriel Fauré - Sonata in A major for Violin and Piano no. 1, Op. 13; Ernest Chausson - Poème, Op. 25; César Franck - Sonata in A major for Violin and Piano; Raymond Deane - Petite Phrase; Maurice Ravel - Tzigane.